Our crusade here in Padada Church with our speaker, Pastor William Nacorda, was a great success. Six adopted ministers (Estrera, Alipan, Basco, Enerio, Otero and Caraballe and one layman, Martin Cahulogan) did the groundwork for this evangelistic activity. Thanks to all our sponsors for your support and for the unending love that you give to God’s Ministry. Thank you and God Bless. By Pastor Cradioniell Niere (adopted minister)…..Hello Mom, how are you? Thanks be to God for His mercies endureth forever. 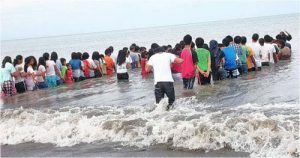 The crusade that I assisted last week baptized 69 souls during its culmination program but another baptism before the crusade resulted to 41 souls baptized – a total of 110 souls. I contributed 5 souls only since I helped for two weeks only. Pastor Muganda, our speaker, was very happy of the result. We give all the credit to the Lord for this success. Right now I have moved to Pastor Dabucol’s Crusade at RMC gym in Davao City. Thanks for the prayers.. God bless our sponsors. We pray for all of you. Last Sabbath was the closing of our one week Health and Gospel Seminar at San Remegio, Kaputian, Island Garden City of Samal under Guadalupe SDA church. Thirty three (33) precious souls accepted Jesus as their personal Savior through baptism. I was the nightly Health and Gospel speaker and also helped with the groundwork. I thank God very much because without Him who blessed the work it might not be successful. Last July 1-14 the Tagum Center Church conducted a crusade headed by Pastor Panuncio, the Sabbath School Director of Davao Mission – our speaker. Twenty seven (27) precious souls and last Sabbath, July 28, we had another baptism, there were 9 who accepted Christ as their personal Savior. Together with me in this crusade are Bro. Dominador Tagalicud and 3 laymen. 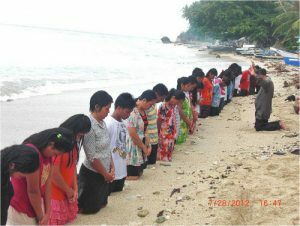 We look forward to another baptism this coming Sabbath in Lapu-lapu Maco Comval Province. God bless. Thank you also of your prayers. Thanks to our sponsors for your prayers and financial help. I continue to pray also for the AaMI. The Church Entrusted With the Message—We are now living in the closing scenes of this world’s history. Let men tremble with the sense of the responsibility of knowing the truth. The ends of the world are come. Proper consideration of these things will lead all to make an entire consecration of all that they have and are to their God…. The weighty obligation of warning a world of its coming doom is upon us. From every direction, far and near, calls are coming to us for help. The church, devotedly consecrated to the work, is to carry the message to the world: Come to the gospel feast; the supper is prepared, come…. Crowns, immortal crowns, are to be won. The kingdom of heaven is to be gained. A world, perishing in sin, is to be enlightened. The lost pearl is to be found. The lost sheep is to be brought back in safety to the fold. Who will join in the search? Who will bear the light to those who are wandering in the darkness of error?—The Review and Herald, July 23, 1895.